It's hard to say, looking only on the web, if Strand Watercraft is serious about their designs. The designs are bold and fanciful, but only conceptual it seems, and the "V8 Wet Rod" is no exception. 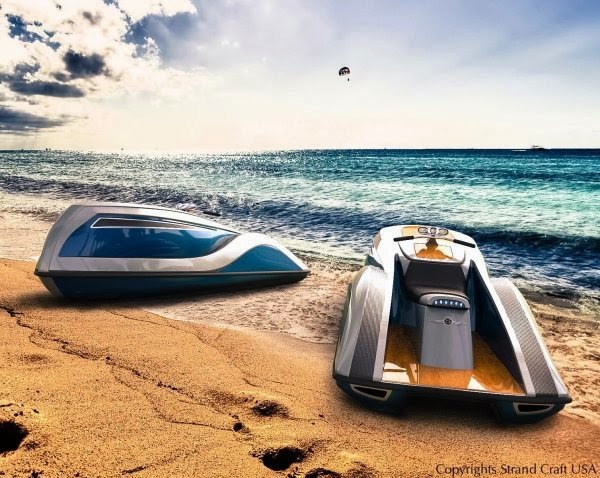 Sporting 16' of carbon hull propelled by a 300HP V8 engine the Wet Rod claims a top speed of 65mph. Given such options as chrome engine detail, wood inlay, and sound systems it's easy to assume its weight (not given) is a bit bloated, reducing performance. Although it has a unique look, it is not an appealing one. It looks like a beached whale.